Life after college can be very daunting for new graduates. I remember how scary I felt the day after my I received my diploma. I wonder what will happen to me whether I’ll pursue writing since I am a BS Journalism graduate or I will stay focused on my hosting career. I’m sure you’ve read this dilemma on My Life, My Job, MyPassion and 6 Things that Made Me Successful post. Fast forward to today, I believe I have conquered a lot of my what if’s in life.I have a job, I created multiple streams of income and I continue to develop my talents and skills. I also think that I made the right decision to be a write for an IT company rather than mainstream media. Blogging also became a big part of the change that I felt over the past years. I am still far from the Clariza that I wanted to be. I still have a lot of goals waiting in line and a lot of lessons to learn. But today I’d like to share the six career lessons that I’ve learned so far after my college graduation. Life won’t always go according to plan. 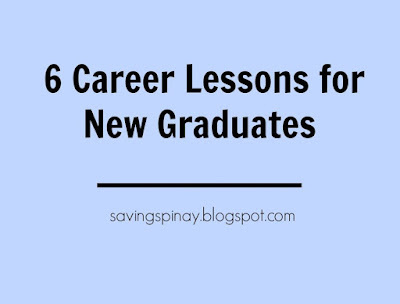 You may have high hopes when you were still studying but as soon as you start your professional life and make actual adult decisions, things will surely change. When I graduated college, I was so sure that I will pursue an event business, take up law and travel the world. However, the event business did not push through, law didn’t happen and up to now the farthest I’ve been is Tagaytay. What I’m trying to say is, no matter how certain you are of your plans in life there is still a great chance that your ways will change. You will grow, you will have a change of heart and you will come up with new interests. Be open-minded and embrace the journey of growing up. Learning doesn’t stop after you graduate. I met a bright young man over the weekend who shared how he’ll balance his work with school. Mind you he is not just after one degree but two. He continually seeks for improvement in his life and I am just so happy that I met him. As new graduates, you need to understand that life is a big classroom. You need to be willing to learn new things. Be an empty cup ready to take more and more information but still select the right thing to perceive. Do not be afraid to follow what you really want to do. When I was still studying I will watch some YouTube videos on my spare time. This led me to discover my life for makeup. Because I really want to do the things that other vloggers do, I showed my confidence and with a digicam I started making YouTube videos. Today, I am now part of the YouTube Creators Academy and my channel is slowly gaining some followers. Others will discourage you and some may say things to stop you from doing what you love, but the choice is always in yours. Have confidence with the gift that God gave you. Now that you are part of the “professional world” expect that your life will change 360 degrees. You’ll meet new friends from your first work, first boss and receive your first pay check. You will experience hardships and what it really means to be an employee. I will be the first to tell you that the road won’t be perfect. My great tip for you is to stop being a perfectionist. There are times when trying to be perfect will limit you to gain more knowledge. Choose to excel rather than putting too much pressure on yourself. You are bound to a wholly life. Live in the present and be expectant of what tomorrow will bring. There are a lot of sources of inspiration available like books, friends, art and traveling. Live life instead of just existing as an average. I may have a little regret that I decided to work so early rather than take a few months break. It seems like I’ve been working for 10 years already when I haven’t even reached my second year. Try to enjoy this time of uncertainty and learn a lot from the day-to-day living. You only live once and if you take everything in a hurry you will surely miss the little things that make life amazing. This post is created with full sincerity. I may not be an expert but these six lessons have let me learn so much about life. I became better and better everyday and I am so excited of what will happen three, five or ten years from now. For new graduates out there I hope that this post inspired you. Don’t forget to comment below if you have any questions or suggestions. Be better in your finances. Save Now, Invest Now and walk your way to success. Sign up in my Email List and receive templates to get you started in your Financial Wealth. Follow me on Facebook and Twitter for better updates. Godbless.